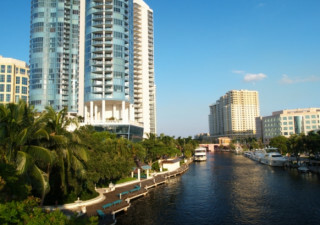 Just outside our hotel, you’ll find the hottest locations for nightlife and entertainment in the city, all along Fort Lauderdale’s gorgeous Intracoastal: The Riverwalk. On the Riverwalk, music, food, and shopping reign supreme with something for everyone in this bustling collection of tourism hotspots and hangouts. Outdoor enthusiasts will hear the calling of the boating and watersport activities available along the New River. Now in its 30th year, the Riverwalk started as a beautification project which now draws in hundreds of thousands of visitors to our city annually. There’s plenty to see and do at the Riverwalk, but Las Olas Boulevard (meaning “the waves” in Spanish) boasts the liveliest street, packed with hip restaurants and bars, water taxi stops, and direct path to the beach. The street starts at the historic Elbo Room and ends at the must-see Fort Lauderdale Museum of Art. Grab your best walking shoes and explore what the Riverwalk has to offer.